New research by the Pew Forum on religion and public life has confirmed once again that the tide of opinion is moving inexorably in favour of gay marriage. In 2oo4, supporters were outnumbered by opponents, by almost two to one (30% to 61%), but supporters now outnumber opponents, by 48% to 44%. The age split confirms that support will continue to grow: the only groups still opposed are those over 50, and the youngest is in favour by 63% to 32%. All this is familiar. What is new in this poll, is its focus on the impact of President Obama’s declared support last May for the principle of marriage equality. Overall, Pew reports that there has been very little change in support since before the announcement – but that it has strengthened support in his Democratic base, and hardened opposition among his Republican opponents. This shift among Democratic voters (especially liberal Democrats) could have a beneficial impact on the gay marriage ballots this November in the Democratic and Democratic leaning states of Maine, Maryland, Washington and Minnesota, and has been widely reported on in the major news media (see for instance,Huffington Post, SF Gate at the San Francisco Chronicle, or Seattle Post PI). The strength of the Pew Forum research organization, as its name implies, is in its focus on religion and religious attitudes, and the extensive historical database of strictly comparable results, which is what I want to focus on here. Catholics strongly support gay marriage. First, note that Catholic overwhelmingly support gay marriage, by 58% to 33% – a margin of 25%, and identical for both White and Hispanic Catholic groups. This degree of support is greater than that shown by any other Christian grouping (Jews and other faiths are not identified), it is substantially higher than that for the population as a whole). This degree of support by Catholics, exceeding that for other groups, has now been well – established in numerous polls. It has also been previously noted that the growth in Catholic support has exceeded that in other groups. Just how dramatic that growth has been, can be seen by comparing the latest results with those from August / September 2010. 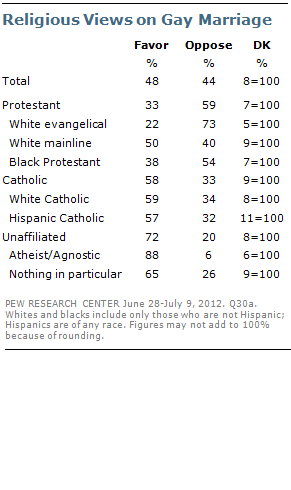 Then, Catholic support for gay marriage was at 46% – a plurality over opposition of just 4%. That plurality has now grown from 4% to 25%, in less than two years. Sunday night I attended the Gallatin County Democrats Grand Opening Fundraiser at their new headquarters on Mendenhall in Bozeman. It was a great potluck- and crowded- which bodes well for the future of Democratic candidates in Bozeman this year. Each candidate was allowed some time to speak. Pam Bucy and Monica Lindeen– both of whom I strongly support- shared energy, enthusiasm and common sense. They both need to be elected, in my very humble opinion. I came to hear the Congressional candidates. I needed to see them and hear them in person. Their speeches were limited to 3 minutes, but all 4 had something important to say- mostly in contraposition to the Republican policy. Kim Gillan spoke about the need to control our own destinies. Franke Wilmer showcased her brilliant career as an academic and as an effective (as a Democrat could be last term) Montana Legislator. Dave Strohmaier shared a vision of the future which relied on non-discrimination (including LGBT persons! ), progressive principles and conviction. And then there was Rob Stutz. Stutz started by talking about taking back the Constitution- both federal and state- from the “hijack tactics of the Tea Party”. Excellent. And enthusiastic applause followed. Then he said something that made me stop. Like I said, I stopped. All of the ideas that were shared by the candidates were excellent ideas. The rhetoric was high. The enthusiasm inspiring. But Stutz is right. Where’s the plan? Because all the good ideas in the world don’t mean anything without a plan. And without a plan, November could be disastrous for Democrats. For me, the political races of 2012 come down to one thing: desire for fairness vs the desire to impose dogmatism. I don’t think I need to tell you which party is for what- or that Denny Rehberg’s history of cooperation is pretty sketchy- and I’m being generous. 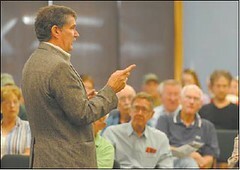 After earning the title of the Tea Party Caucus’s top earmarker, and after giving himself five pay raises in Congress, Montana’s millionaire Congressman is now telling Montanans that they should turn to their local governments if they need any help. What Rehberg forgot to mention was that the last time Congress approved earmarks, he earned the title of “tea partier with his name on the most earmarks” — requesting more than $100 million for Montana. Rehberg, one of the wealthiest members of Congress, also failed to mention that while he was spending millions in taxpayer money, he gave himself five pay raises during his 12 years in Congress–at a time when hardworking Montanans were nation was struggling. Hmmm. 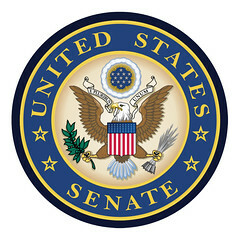 Votes to RAISE his own pay in 2006, 2005, 2004, 2003, and 2002 (NOTE: The 2006 pay raise was later blocked by the Democratic Congress in 2007).